Acting CEO of national energy company Ukrenergo Vsevolod Kovalchuk estimates investment to be made by Ukrainian electricity market operators in measures to integrate into the European Network of Transmission System Operators (ENTSO-E) at UAH 11 billion, or about EUR 350 million. 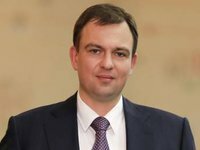 "According to preliminary estimates, all together will require UAH 11 billion (EUR 352 million), but one should be aware that it is extremely difficult to tell which money is needed for measures related to the integration and which for maintaining, among other things, the reliability of our own power grids," he told the Delo publication in an interview. "For example, thermal power plants' power units should upgrade automatic load-frequency control equipment and connect it to the central regulator. All nuclear power plants need additional modernization of the excitation system of generators. We estimate the generating companies' investment alone at EUR 150-200 million," he added. In 2018-2019, Ukrainian power plants' power units must be tested for checks on the dynamic stability of the power grids, he said. All technical conditions and configuration of tests have been agreed with ENTSO-E.
"We are now on schedule without delay, we are in constant coordination with Moldova, we have signed a memorandum on the governments' level. We have also signed a memorandum with all Ukrainian electricity companies who have declared their readiness for integration. I think investment in modernization of generating equipment could start after all tests are over," he added. As reported, Ukraine and Moldova in April 2018 signed a memorandum on cooperation and joint actions between the two countries' relevant ministries aimed at ensuring European integration processes to achieve the synchronous operation of the power grids of Ukraine and Moldova with ENTSO-E. In June 2017 Kovalchuk signed an agreement on the conditions of the future unification of the energy systems of Ukraine and Moldova with ENTSO-E. In July, the agreement came into force after it had been signed by the necessary number of European electricity transmission system operators. ENTSO-E, the European Network of Transmission System Operators, which was established in 2009, represents 43 electricity transmission system operators (TSOs) from 36 countries across Europe. It united six industry associations that existed at that time: ATSOI, BALTSO, ETSO, NORDEL, UCTE and UKTSOA. Ukrenergo operates trunk and interstate transmission lines, as well as centralized dispatching of the country's integrated power grids. Ukrenergo is a state-owned enterprise under Ukraine's Ministry of Energy and Coal Industry, but it will be transformed into a private joint-stock company.